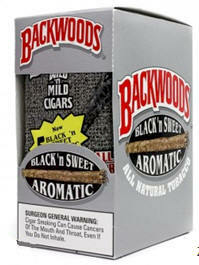 Smokers identified Backwoods Black n Sweet Cigars Singles 24 cigars - 5/8's 40 cigars image with the cowboy smoke from America's wild west. The rustically designed airtight foil pouch, added to that look and, importantly maintained the cigar's high moisture level. Their unique style, taste, aroma and package has made Backwoods Black n Sweet Cigars Singles 24 cigars - 5/8's 40 cigars the number one selling all natural cigar in the world.